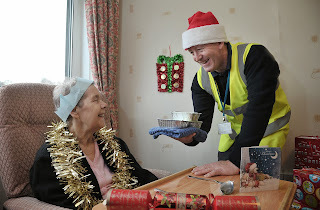 Caption: Community Meals Leeds driver Alan Scott, a member of the team working on Christmas Day, delivers a meal to Margaret Drooker, 75. Hundreds of elderly, disabled and vulnerable residents across Leeds will get a Christmas dinner with all the trimmings delivered to their door this year. A dedicated team from Leeds City Council’s Community Meals Leeds service will be working on Christmas Day, going on their rounds across the city. Around 20 staff will be out on the road, delivering an estimated 220 festive lunches including turkey and Christmas pudding. 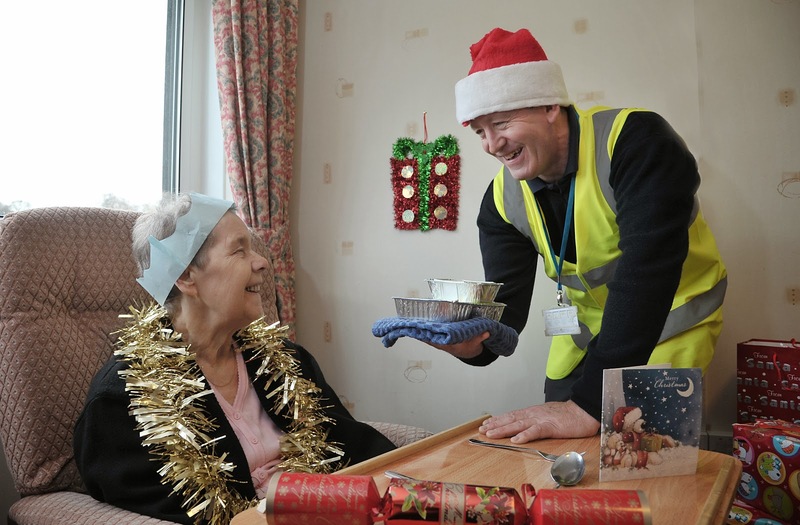 For many customers the person who delivers their meal may be the only contact they have on Christmas Day. “For many of our Community Meals Leeds customers, having their Christmas dinner delivered not only means they can be sure of a hot meal, it can also be the difference between seeing a friendly face on Christmas Day and spending the day alone. “While many of us are spending Christmas Day with our family and friends, members of the Community Meals Leeds team will be out making sure some of our city’s most vulnerable residents are not alone. Earlier this year Community Meals Leeds was announced as the winner of the National Association of Care Catering’s (NACC) National Community Meals Award. The prestigious award recognises the authority, business or individual who has proved themselves the best at providing the vital resource to elderly and vulnerable residents. Community Meals Leeds, run by Leeds City Council, delivers an estimated 124,000 meals every year to more than 500 people around the city. The service has been delivering hot meals to Leeds residents for more than 30 years.